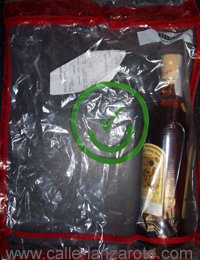 The decision to bring a bottle of Ronmiel back from Lanzarote with us posed a problem – how to get it home with us. With enough time, we may have arranged some form of packaging and risked the glass bottle in the middle of one of our suitcases. But without this option and since the ban on liquids in hand luggage stopped us taking a bottle with us that way, we resigned ourself to trying to get one properly sealed in the airside part of Arrecife airport. “Resigned”, because on our previous visit we had tried to buy something else there and had been unable to get the purchase sealed for transit. The rule appears quite simple to me: anything you buy that contains liquids must be sealed in a special plastic bag along with the receipt. Except that it obviously took a while for the merchants at the airport to adapt to this system – and invest in the equipment to do so. “We don’t have the machine” and “you don’t need to do that when you fly from here” were the answers we encountered. That’s all well and good if you are on a direct flight, but since we would be going through the transit lounge in Madrid, I did not want to take the risk of having everything taken back off us again, and we gave up. So with Ronmiel in our sights, on our last visit we tried again. This time we actually found a shop called “Sibarium” in the airport that was able to seal the bottle as required for transit and our cherished Ronmiel made it safely via Madrid back to Germany without any problems. The aeronautical museum on Lanzarote is located in the old terminal building at the airport. The museum seems to suffer a lack of visitors, as its homepage states that one of its aims is to increase awareness of its existence amongst the local population. I had passed it on previous occasions, but being en route to the new airport to catch a flight to Madrid I did not have time to visit it. Instead, I always made a note of going there on my next visit. This time I actually managed it, and although I was not disappointed, I did begin to understand the problem that the museum has, because there was almost no-one else there! The building is located further inland than the current terminals, near the main road. It has its own car park, but for some reason the entry to the visitors’ car park is confusingly preceded by a sign declaring that “authorised vehicles only” may pass. 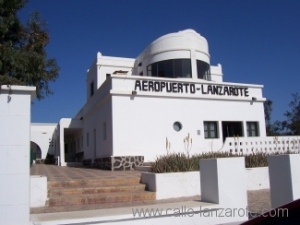 Although Lanzarote did have an airport in the 1930s and was even flown over by airships on their way to the USA, this closed during the Spanish Civil War and it was not until 1946 that a civilian airport was opened again. The passenger terminal was very modest, consisting of a few rooms and a small control tower on the front. The aircraft would roll up to just in front of the building, at which point the passengers would come out through a side door and walk over to them. However until the 1970s the only flights were to the other Canary Islands – there was not even an air connection to Madrid – so this was probably more than sufficient. 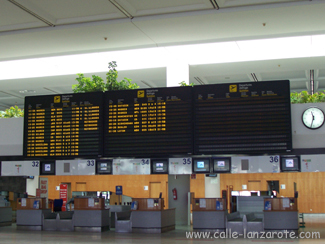 In 1970 the current Terminal 2 was opened, and flights to the Spanish mainland started. The museum contains interesting photos and artifacts of those years, and as such is worth a visit. 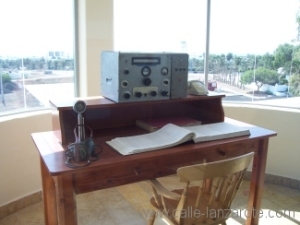 You can even go into the old tower and see the radio equipment that used to be operated by a single person. Entry to the museum is free and the staff speak Spanish, English, German and French, although most of the descriptions of the photos are only in Spanish. Tours can be arranged in advance, but are not a requirement. Opening times are Monday to Saturday, 10am to 2pm.